ProChannel can be displayed either collapsed or expanded in the Inspector and Console view. When collapsed, only a subset of all available controls are visible. Note: When expanding ProChannel in the Inspector, ProChannel fills the entire width of the Inspector. When expanding ProChannel in the Console view, ProChannel extends to the right of the channel strip. Figure 418. ProChannel can be displayed collapsed or expanded in the Inspector and Console view. Expand/Collapse . Expands/collapses the ProChannel module. Preset. Shows selected preset name. Hover the mouse over the Preset control to access Load Preset and Save Preset controls. For details, see Presets. Pre/Post . 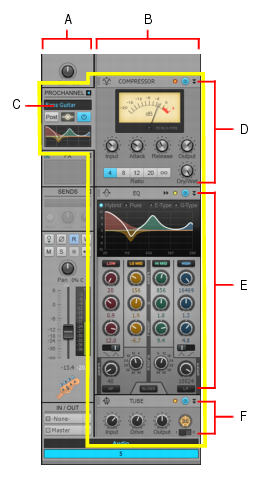 Specifies if the ProChannel signal is routed prior to the channel’s FX Rack (pre) or after the FX Rack (post). Global input meter. Activity indicator that shows if any module is processing audio. Global enable/disable. When enabled, the audio signal flows through ProChannel. When disabled, ProChannel is bypassed. QuadCurve Equalizer graph. Shows the equalization curve. Collapse . Collapses the ProChannel module. Preset. Shows selected preset name. For details, see Presets. Insert Module (Inspector only). Lets you insert a new module from a pop-up menu. See also To replace a module. Gripper. Drag up/down to reorder the module. Icon. Each module category has its own unique icon. For details, see Module categories. Clipping LED. Shows if the input signal to the module is clipping. 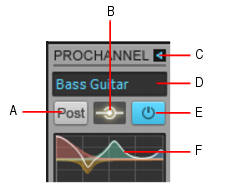 If there is any distortion in the ProChannel signal chain, the clipping LEDs let you identify where the clipping occurs. Minimize/Restore. Collapse and restore the module height. 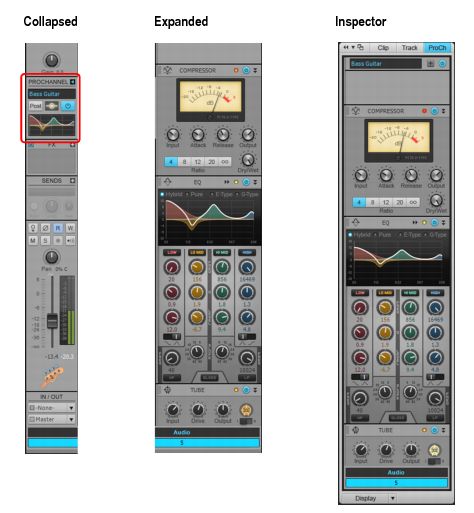 Hold down the CTRL key and click to collapse/restore the same module on all selected tracks. Hold down the ALT key and click to collapse/restore all modules in a track. Figure 421. Module header controls. ProChannel includes several presets to get you started. However, because all audio material is different, the real power and fun is to experiment with the controls to come up with settings that suit the audio material you are working with. ProChannel presets are saved to disk as *.pcp files. By default, presets are stored in the <SONAR program folder>\ProChannel presets folder. To change to the default preset folder, go to Edit > Preferences > File - Folder Locations. Figure 422. Use presets to save and recall favorite settings. Preset list. Shows selected preset name. Choose any existing preset from the list. Preset. Shows selected preset name. Load Preset . Opens the Open dialog box to the default preset directory. Choose a preset and click Load to load the preset. Save Preset . Opens the Save As dialog box to the default preset directory. Type a name and click Save to save the current ProChannel settings as a new preset. To overwrite an existing preset, type the same name as the existing preset. Note 1: To see the Load Preset and Save Preset buttons in the Inspector and collapsed Console view strips, hover the mouse over the Preset control. Note 2: If a preset is referring to a plug-in that is missing, only the module header is loaded and the module is collapsed. When expanded, the module will be empty to indicate the plug-in is missing. Chorus, flanger, phaser, vibrato, tremolo, etc. Note: The number of available categories depends on the modules you have installed. By default, SONAR includes Equalizer, Compressor, Gate and Tube Saturation modules, and therefore shows the Frequency, Dynamics and Simulation categories.